After Jamal's triumph at the world box-office, isn't it time to finally greenlight the movie about the coming-of-age saga of Pi Patel? Entertainment Weekly wrote this week that the spiritual and physical adventure portrayed in the novel, Life of Pi may make it to the screen with the help of Oscar winning director Ang Lee (Brokeback Mountain, and Crouching Tiger, Hidden Dragon). For nearly seven years Hollywood has been toying with the idea of transforming the best-selling Man Booker Prize winning Life of Pie into a movie but solid efforts including that involving M Night Shyamalan faltered. Now, Variety and other Hollywood sources buzz that Lee, could begin working on the movie version of Yann Martell's novel that has been translated into more than 20 languages Fox Searchlight which distributed the 10-Oscar nominated Slumdog in North America and India, grossing over $92 million (and still growing) also has the rights to Life of Pie. The early part of the book is set in Pondicherry, and had Shyamalan had gone ahead with the project, it could have become his second film to be shot in India, following his debut, Praying with Anger. (Pondicherry is also the birth state of Shayamalan, though he was born in Mahe, several hundred miles from Pondicherry city). Shyamalan, who hardly works on films based on other sources, last made The Happening, a film that cost about $50 million but grossed a strong $160 million worldwide and restored his reputation. Alfonso Cuarón (Children of Men) also considered film versions of the fantasy novel. 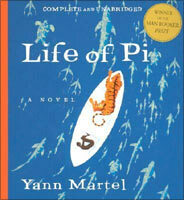 It is not uncommon in Hollywood for prized novels such as Life of Pie to go through many avatars before a script that fully engages the executives. At any rate, the book is quite complex, and not all award-winning, best-selling novels succeed at the box-office.The latest example in Blindness, based on the Nobel laureate's Jose Saramago's book and directed by Fernando Meirelles (The Constant Gardner, City of Gold). The film was a critical and box-office bomb. Life of Pi by the Canadian writer is an allegorical story of the son of a zookeeper who, after his family sets out to move to Canada accompanied by their animal menagerie, becomes the sole human survivor of a shipwreck. Pie Patel survives a shipwreck and then spends 227 days on a boat on the Pacific Ocean on a 26-foot lifeboat with an injured zebra, a spotted hyena in a bad mood, a seasick orangutan, and a 450-pound tiger called Richard Parker. The film will also need a charismatic Indian actor (like Dev Patel in Slumdog Millionaire) to dazzle the audiences. 'It sounds like a colorful setup, but these wild beasts don't burst into song as if co-starring in an anthropomorphized Disney feature,' cautioned an Amazon.com reviewer.